These quick and easy Grilled Shrimp Skewers take only minutes to prepare. They are perfect as finger food or appetizer for any barbecue cookout. 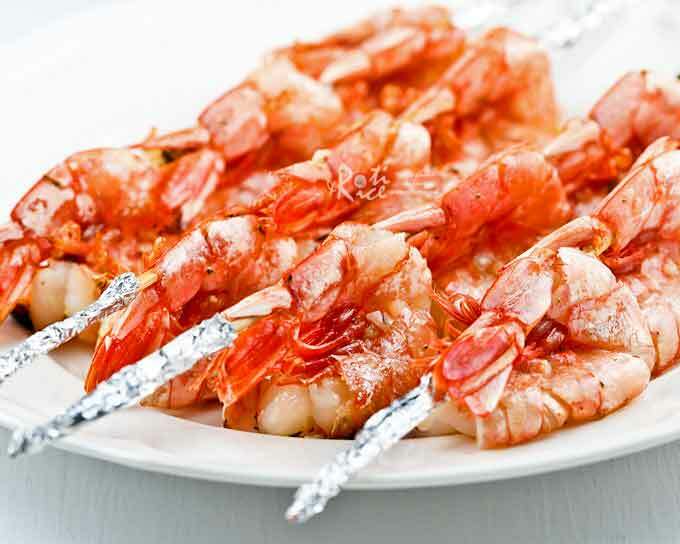 Shrimps cook very quickly on the grill and are the perfect finger food or appetizer for any barbecue cookout. Frozen shrimps can be defrosted in the sink in no time at all. The marinade is usually quite simple and pretty quick to prepare. 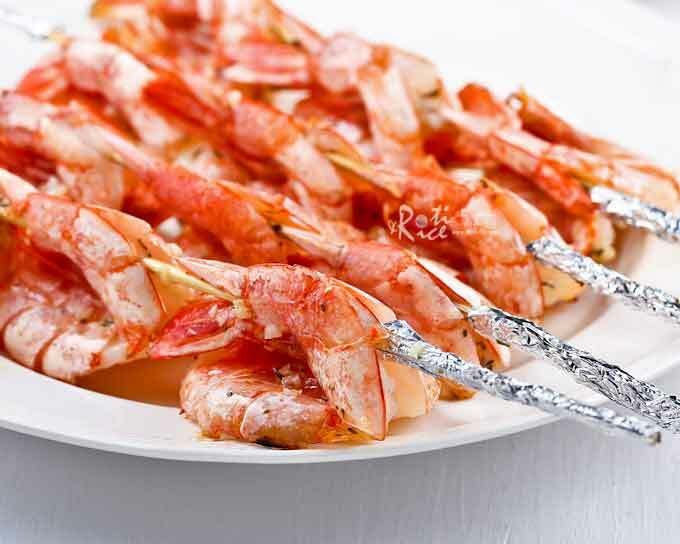 Since shrimps are relatively small, one of the best ways to grill them is to put them on skewers. This will prevent them from falling through the grates and be totally charred. Grilled Shrimp Skewers also make a better presentation and can easily be portioned out to each person. This really makes sense especially when you are feeding a crowd. Sometimes you can make these Grilled Shrimp Skewers go further by adding vegetables or even sausages to each skewer like these Shrimp, Sausage, and Vegetable Kebabs. Either way, they are very tasty and fun to eat. Successful grilling of shrimps is all about planning. 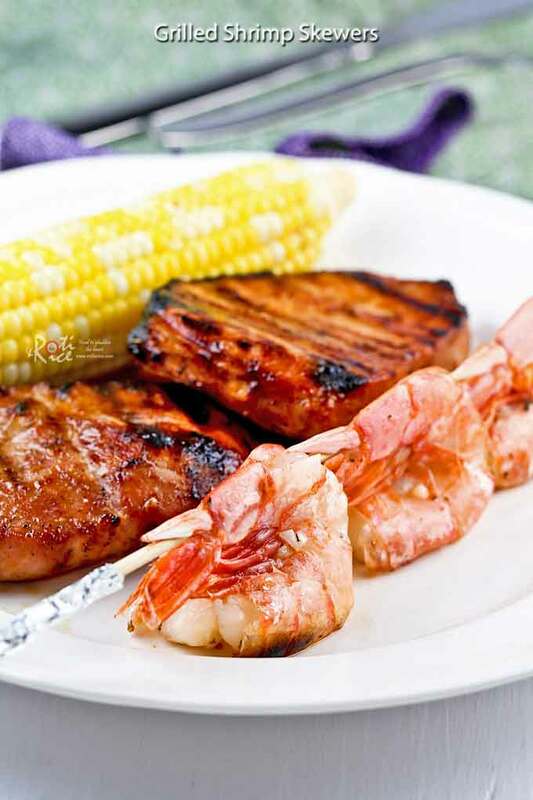 Avoid grilling shrimps when you have just fired up the grill. Shrimps stick easily to the grating and the fluctuating temperature during the startup can lead to uneven cooking. The shrimp skewers can be totally over cooked on one end and under cooked on the other. Ideally, the grill should already have been in action grilling some other heavier meat like chicken or pork. Then, simply add the shrimps in for 3 minutes and you are done. This is because the steady heat after the grill had been at it for 10 minutes or so is ideal for cooking shrimps without drying them out or under cooking them. You will achieve that white succulent flesh with tinges of red where the shell meets the flesh. These jumbo shrimps came cleaned and butterflied which is really nice. I think they cook better this way. Also, always remember to soak the skewers before use. Soaking will prevent them from burning up. I also find that wrapping the exposed ends with aluminum foil helps. Soak 4 large bamboo skewers in water for 30 minutes. Butterfly the shrimps leaving shell intact. Remove vein. Rinse and pat dry with paper towels. Place butter, minced garlic, dried thyme, and salt in a small microwave safe dish. Place in the microwave and microwave on 70% power for 45 seconds to melt the butter. Remove from microwave and stir to combine. Skewer 3 shrimps by the tail on each bamboo skewer. Wrap both exposed ends with aluminum foil to prevent the bamboo skewers from burning. 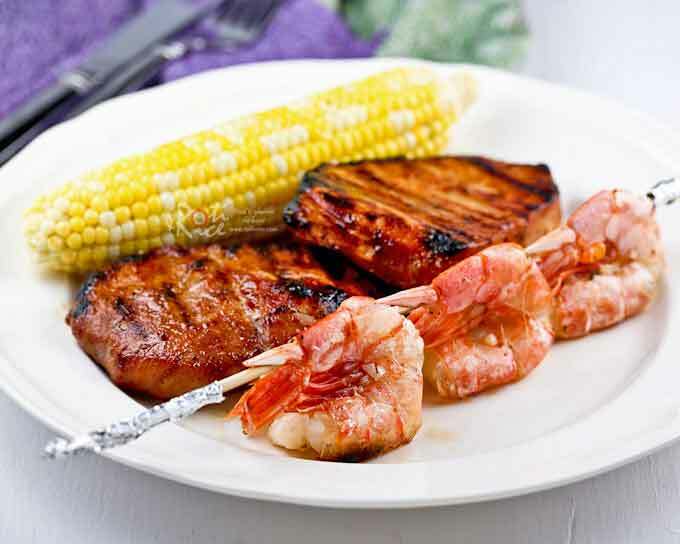 Brush marinade over shrimp flesh. 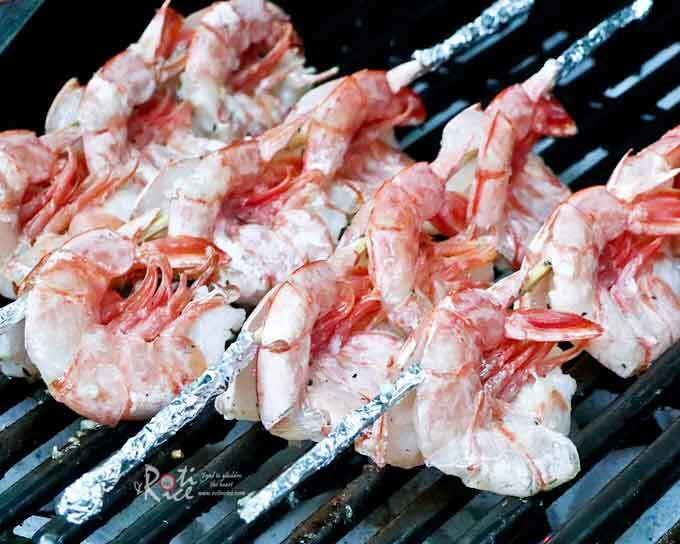 Place shrimp skewers on preheated grill with cut side down for 3 to 4 minutes or until they turn pink. We really enjoyed the simplicity of these succulent Grilled Shrimp Skewers. They paired really well with the Grilled Pork Chops I shared yesterday. I hope you will get to give both a try soon. Bon Appetit!